Travel's taken a big beating in the last couple of years, and one of the results is that there are now deals to be found on any type of travel. Cruises, having traditionally been a high-cost way of vacationing, may have seen more than its fair share of discounting and it's continuing. Arthur Frommer, and other travel writers, have covered this in some detail, but since I don't normally take cruises, I haven't yet said much about them. Something that's become obvious is that the best discount cruises are often what's called 're-positioning cruises'. These are routes that exist mainly to get a ship to a high interest departure port from elsewhere in the world. You'll often find that these cruises are charged less than half of a normal all-inclusive fare, and with the connecting flight thrown in. This is especially important as the cruises are going in one direction only, with the departure and arrival ports different. 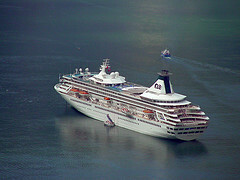 For example, you may find that a cruise may depart from Venice, Italy, and arrive in Miami, Florida. A one-way flight from anywhere in the U.S. can easily be $1,200 per person unless booked by the cruise line. Of course, these special deals aren't always that easy to find, and dealing with a cruise specialist will pay off very quickly. Not only is someone very knowledgeable able to find you that great headline fare, but he or she is often able to get you complimentary upgrades and discounts. For example, while booking a cruise directly, you may get the same base fare, but you'll have to pay for your alcoholic drinks and spa access separately even when the cruise is billed as all-inclusive. The specialist travel agent could get you this included for free. Even outside of the re-positioning cruises, there are deals to be had, and without quite as much hunting around on the internet. Cruise lines are having a hard time during this economic climate, and some, like Disney, are offering free tickets for kids on some cruises. These sorts of things are often included for those who book, and pay, well in advance of their travel. As with any travel, and especially trips that do require a hefty outlay, it pays to shop around. Also, read the terms and conditions very carefully before booking, so you know exactly what your money pays for. It'll help avoid surprises later! So, if you're in the market for a cruise this summer, get searching now, and you're more likely than ever to find a great deal. Last updated by jack on 02 January, 2011 in Travel. I love cruises. if they are cheap, I may take one this summer.